Photo caption: Suffering for a belief…following Falun Gong brought Jennifer Zeng better health and incredible pain. Jennifer Zeng’s memoir, Witness History-One Woman’s Fight for Freedom and Falun Gong, is the kind of book that leave you feeling shocked, depressed and-most of all-angry. Describing the Chinese Government’s brutal persecution of tens of thousands of followers of Falun Gong-a pacifist and apolitical movement based on the tenets of truth, compassion and forbearance-Zeng’s book inspires such outrage that readers will probably feel the need to research the situation for themselves to see if the author has exaggerated the scale of the tragedy or the outrageousness of the Government’s actions. Sadly, it seems she hasn’t. While the plight of the Falun gong practitioners (or “students” as they call themselves) has been reported in the West, it certainly hasn’t received the attention it deserves. Founded in 1992, the movement-a combination of Buddhism, Taoism and Qigong-was outlawed in 1999, when the number of Falun Gong students in China reportedly outnumbered the membership of the Chinese Communist Party. The catalyst was thought to have been a peaceful protest by 10,000 practitioners who gathered in response to the harassment of some of their member by police. The group dispersed without incident after their petition was submitted, but perhaps more frightened by the size of the organization than by its peaceful, apolitical ideology, the Communist Party promptly initiated a crackdown that saw tens of thousands arrested in one day, while the Government-run news media began an insidious propaganda campaign. Worse was to come, as Falun Gong students were imprisoned in “re-educaiton camps” where they were tortured, beaten, brainwashed and often killed. Zeng’s life had hardly been trouble-free before her imprisonment. A botched medical procedure in 1992 caused two massive internal haemorrhages, and an ensuing blood transfusion left her with hepatitis C.
“Movement of any sort made me nauseous,” she writes, adding that she “felt so wretched that life hardly seemed worth living”. 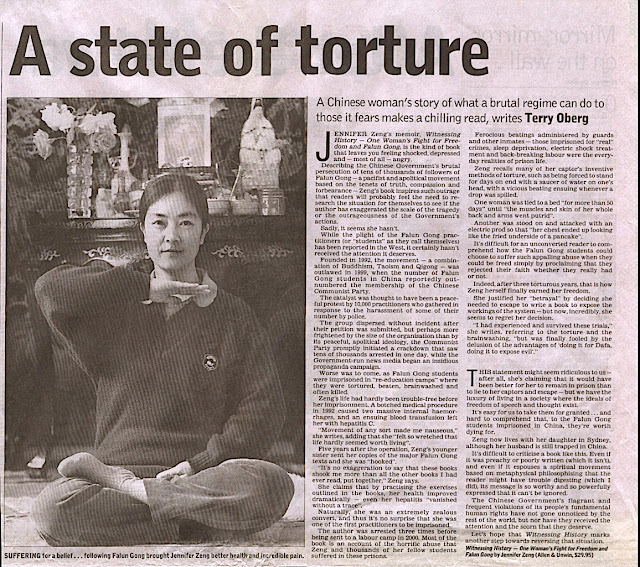 Five years after the operation, Zeng’s younger sister sent her copies of the major Falun Gong texts and she was “hooked”. “It’s no exaggeration to say that these books shook me more than all the other books I had ever read, put together,” Zeng says. She claims that by practicing the exercises outlined in the books, her health improved dramatically-even her hepatitis “vanished without a trace”. Naturally, she was an extremely zealous convert, and thus it’s no surprise that whe was one of the first practitioners to be imprisoned. The author was arrested three times before being sent to a labour camp in 2000. 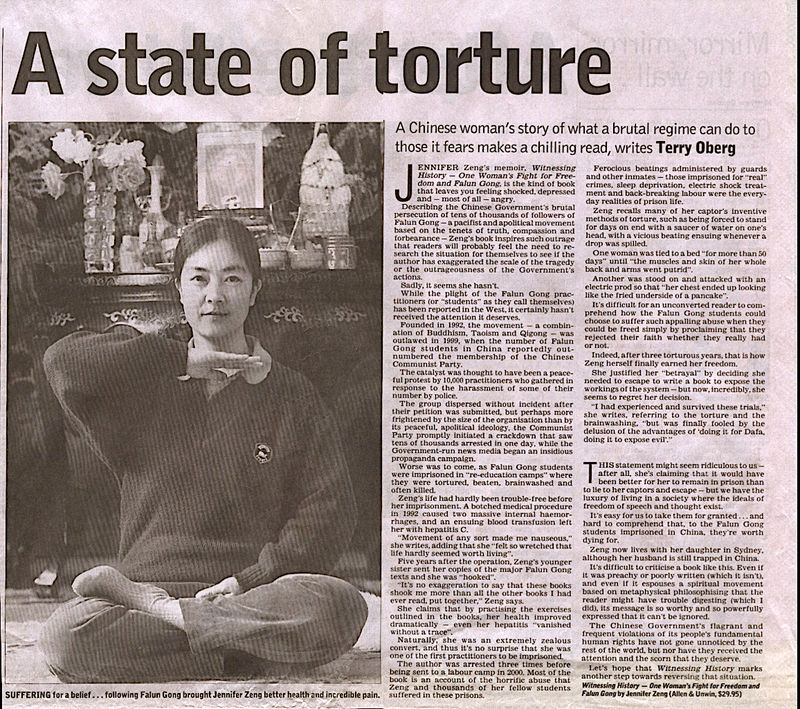 Most of the book is an account of the horrific abuse that Zeng and thousands of her fellow students suffered in these prisons. Ferocious beatings administered by guards and other inmates-those imprisoned for “real” crimes, sleep deprivation, electric shock treatment and back-breaking labour were the everyday realities of prison life. Zeng recalls many of her captor’s inventive methods of torture, such as being forced to stand for days on end with a saucer of water on one’s head, with a vicious beating ensuing whenever a drop was spilled. One woman was tied to a bed for “more than 50 days” until “the muscles and skins of her whole back and arms went putrid”. Another was stood on and attacked with an electric prod so that “her chest ended up looking like the fried underside of a pancake”. It’s difficult for an unconverted reader to comprehend how the Falun Gong students could choose to suffer such appalling abuse when they could be freed simply by proclaiming that they rejected their faith whether they really had or not. Indeed, after three torturous years, that is how Zeng herself finally earned her freedom. She justified her “betrayal” by deciding she needed to escape to write a book to expose the workings of the system-but now, incredibly, she seems to regret her decision. This statement might seem ridiculous to us-after all, she’s claiming that it would have been better for her to remain in prison than to lie to her captors and escape-but we have the luxury of living in a society where the ideals of freedom of speech and thought exist. It’s easy for us to take them for granted…and hard to comprehend that, to the Falun Gong students imprisoned in China, they’re worth dying for. Zeng now lives with her daughter in Sydney, although her husband is still trapped in China. It’s difficult to criticize a book like this. Even if it was preachy or poorly written (which it isn’t), and even if it espouses a spiritual movement based on metaphysical philosophizing that the reader might have trouble digesting (which I did), its message is so worthy and so powerfully expressed that it can’t be ignored. The Chinese Government’s flagrant and frequent violations of its people’s fundamental human rights have not gone unnoticed by the rest of the world, but nor have they received the attention and the scorn that they deserve. Let’s hope that Witnessing History marks another step towards reversing that situation.